Peggy & Co. August 2016 – Peggy & Co.
Typographic terminology is sometimes very specific and can be very confusing – even for seasoned designers. A character is the symbol representing an individual letter, numeral, punctuation, sign, symbol, accent, or other elements in a typeface. 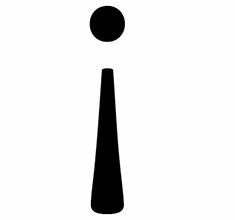 A glyph is the actual representation of that character. Several glyphs may represent one character as in this example.